It looks as if — for now, anyway — we’re not just a five cat family; we’re also a one rabbit family. On Tuesday, for no apparent reason whatsoever, a rabbit appeared in the yard. We were standing in the kitchen when Kris said, “Look. Meatball is chasing a rabbit.” Sure enough. The big dumb oaf was chasing a white and brown bunny across the grass and into the boxwood hedge. We went outside and spent several minutes trying to catch the rabbit, but to no avail. It’s got some smooth moves. Over the past few days, the cats have gone from the aggressors, however, to the pursued. The rabbit has warmed up to them — and to us. It won’t let us pet it, but it does like to hop close to us. And to the cats. In fact, when it sees a cat, it bounds after it, essentially chasing the poor feline. The cats don’t really care for this. We’re not sure what to do with the rabbit. We’ve asked the neighbors, and nobody is missing a bunny. We asked on the neighborhood email list, and nobody knows anything about it. I guess our next step is to put up signs around our community. I want to keep the rabbit of course (though outside — I don’t want an indoor rabbit). Kris, naturally, is opposed. I think she’ll change her mind if we name it, but I’m at a loss as to what to call our little friend. Hazel? Bigwig? Briscoe? Conejo? Stew? This brings back great memories for me! When I was a kid we had a small black dog, a white cat and a white rabbit. They got along great and used to play tag in the front yard. Sometimes the traffic out front slowed to a crawl as people watched them playing together. How about the name Thumper since this one seems likely to hold his own in a fight. Or Patch since its coloring is patchy and it is probably going to turn your garden into a rabbit patch — lol! If it’s chasing the cats, you should probably name it General Woundwort! Where’s the “like” button? Matt’s comment deserves it. Since you will officially have “hrair” pets, I think you should name it Fiver! 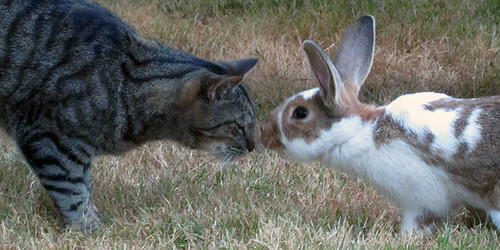 The nose to nose cat and rabbit picture is adorable. Is Kris opposed to keeping the rabbit outside? Meaning that she wants an indoor rabbit, or is she opposed to keeping the rabbit ? I think that keeping the rabbit outside is a great idea, at least until winter time. At the Montessori School, several classes had pet rabbits, kept in cages, or let loose to hop around the classroom. The cages were always so smelly, even when cleaned often, for their urine is strong smelling. When left to roam round, they would leave droppings everywhere. As for a name, look at its brown markings, do you see any recognizable shape?